Kilo the pit bull was about to see the end of his life at a local animal shelter, when Candice Miller brought him home. "Rescued in literally his last hour," Miller says. The brown and white doggie had arrived at the shelter, where Miller volunteers, from a home where it was said he'd been beaten, and forced to live outside, and where he didn't get enough to eat. He and a female dog were bred, and then, Miller says, their puppies were subject to the same conditions. That past had left Kilo fearful. He was so nervous that he crawled on his belly, when moving around the shelter. Miller devoted herself to improving his confidence, but Kilo was still overlooked. Miller needed some healing, too. She'd recently quit a job that had left her stressed, depressed and anxious. One of her older dogs had recently died; she was heartbroken, to boot. Taking care of shelter dogs, especially the pit bulls, was how Miller tried to soothe herself. She'd noticed they "got looked over" but "were incredibly gentle, sweet, loving and affectionate even in the shelter environment. It was impossible not to fall in love!" She fell hard for Kilo. But no one else did; he just wasn't putting on his best face for potential adopters. After a couple of months, Kilo was given five more days to be adopted, or he'd be euthanized. Miller checked in on him every day. No takers. On the last day, when she called, Miller was told Kilo was in the holding area, waiting his turn to die. She started to cry, then rushed right over to pick him up. "The rest was history," she says. "Kilo came into my life at a point where I needed him the most ... We both had been through some bad stuff, but together are absolutely happy and healthy." Kilo -- and Miller -- got lucky, as did the three other pits, including a spectacularly adorable new puppy, Miller's also taken in in the last few years. It's estimated that some 800,000 - 1 million pits are killed in shelters every year. And Miller's goal now is to help other pups, like hers, find their own happy families, by showing the world how great it looks when your home, your life, is overrun by dogs. This is a goal Miller wouldn't have imagined for herself 3.5 years ago, when her son brought home Roofus, the first pit to enter her household. The brown doggie was just a couple months old, and very sick, when he arrived to a nervous welcome. "I was on the Internet for hours searching bite statistics and pit bull traits. Of course the first sites that popped up were anti-pit bull so my information was totally skewed and I was a complete nervous wreck having him," Miller says. But before long, he'd started getting healthier -- and his goofy, smart, loving self came out. "He just had this charming personality," says Miller. "As he grew with us I realized [Roofus] was just a dog like all the others." And with that, he became one of the family -- and they became champions of dogs like him. The family lives not far from Sacramento, California, and consists of Miller, her husband, their daughter and son, his girlfriend, a tortoise cat named Torty, six permanent dogs and a rotating cast of fosters. Miller says she's hoping to buy some land soon, where she can rescue and foster even more. "They are my all day, every day," Miller says. "The best thing is you are never lonely." These days, four of the dogs are pits, the newest of whom is Penny the puppy. Penny was recently extracted from what Miller describes as a "scary situation" -- a chaotic home where the mom dog was killing her puppies, and the humans were too overwhelmed to step in. Two of five pups were still alive when Miller showed up to take them away in mid-March. One of those died at the veterinarian's office. "For the next three days care of Penny was critical. I fed her almost every hour. She had to be burped after feeding and stimulated to go to the bathroom. She was so weak and I was very afraid I'd lose her," says Miller. "She is a survivor." 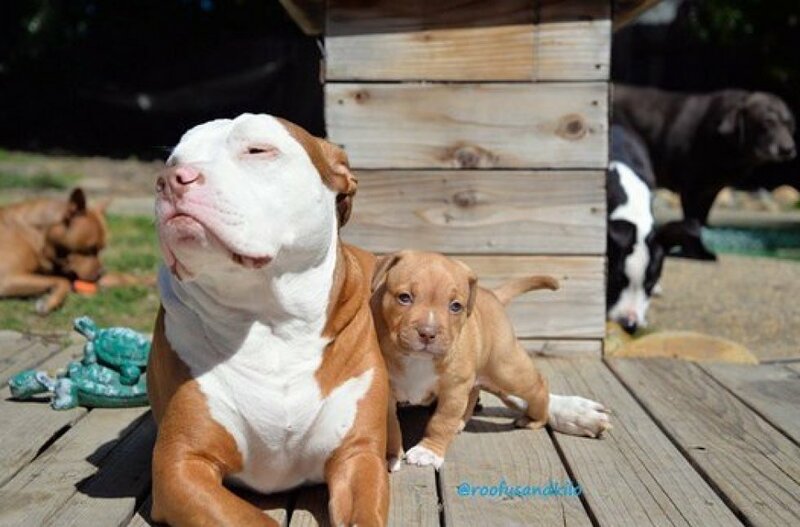 From these beginnings, Miller now proudly shares photos and videos of this bully-full family on Instagram and Facebook, where tens of thousands of fans regularly ogle their amazingly cute daily goings-ons. Come for the photos of the cutest puppy in the world bonding with her big canine brothers. 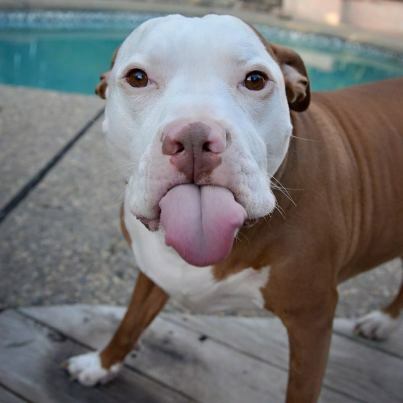 But, Miller hopes you'll stay and become part of this passionate, proud, pit bull-loving community that is committed to dislodging harmful, untrue stereotypes, and helping other great dogs find their ways into their own great homes. "I actually was someone who if you asked me about owning a pit bull five years ago I would've told you you were crazy," she says. "I'll never push mine on anyone. But I do know that they have changed minds and I think that's pretty amazing." Follow Roofus, Kilo and the gang on Instagram and Facebook.